I do not know how I managed for Karma to be pissed at me. Somehow I have become the most unlucky person ever. Yesterday, I nearly lost my finger due to Liquid Nitrogen. It was my wedding finger. Of all essential fingers to lose. Last night, I had an allergy attack, with my one eye swelling up. I now look like I am in an abusive relationship. Name it whatever you want: dieting, changing your lifestyle, taking control, a new you. It all comes down to the same thing: You want to be thin. The consumption of all the normal vices is obviously prohibited and often you crave something crunchy-crunchy. 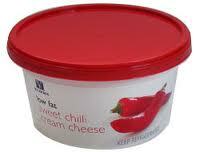 I found the best alternative to toast, chips, and other crunchy-crunchy foods. I have been snacking on Baker’s Cracker bread (the Rye one) for ages. I have always added tuna and Trim (a lovely low fat salad dressing), Bovril and cheese, or Avocado. They are all pretty yummy, but the one recently discovered changed my life. 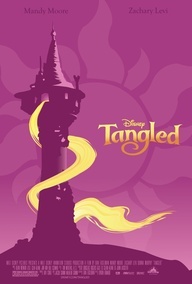 Tangled is derived from the German folklore tale Rapunzel, written by the Brothers Grimm. The film spent 6 years in production. It was originally named Rapunzel, with a last minute change to Tangled. When a single drop of sunlight falls to earth, it becomes a golden flower filled with magical properties. A very old woman, Gothel, discovers the flowers and hoards its healing abilities, keeping it for herself, making her live for a very long time. In a nearby kingdom, a queen becomes very sick. Her husband the king, searches for the plant to save his wife’s life. Despite Gothel’s effort, he finally finds it, and the queen recovers. She gives birth to a princess, and the plant’s healing powers becomes part of the new-born, in the form of extremely long, golden hair. Knowing the only way to remain immortal and beautiful is through the plant’s powers, steals a lock of the princess’ hair, discovering that cutting it makes the hair lose its power. She decides to kidnap the princess, naming her Rapunzel and hiding her in an isolated tower. Rapunzel’s parents miss her terribly, and honour their memory of her by releasing lanterns into the sky on the night of her birthday each year. Each year Rapunzel sees the floating lanterns, never knowing she is the reason they float. On her eighteenth birthday, she asks permission of her “Mother” Gothel to go to the source of the light. Gothel refuses, telling her it is too dangerous, and that she is only locked away for her own safety. Meanwhile in the kingdom, Flynn Rider is getting himself into a lot of trouble. He, with some accomplices, steals the tiara of the lost princess. The royal guards chase after them, and Maximus, horse of the Captain of the Guards, gets separated from his rider, but continues the search on his own. Flynn manages to escape both the guards and riders, finally ending up at Rapunzel’s tower. He stupidly climbs to the top, where our heroine knocks him out with a pan on the head. Rapunzel hides the stolen crown, telling him in order for her to return it to him; he needs to take her to see the lanterns. Flynn reluctantly agrees, hoping to scare her off her quest by taking her to the Snuggly Duckling Inn, a place where all the thugs in town hang out. She, however, charms the thugs, and encourages them to follow their dreams. Gothel returns early to the tower, finding a tiara but no Rapunzel. Being her scheming self, she teams up with Flynn’s earlier, and deserted, accomplices. She promises them the tiara if they help her get Rapunzel back, as well as the added benefit of revenge on Flynn. Flynn and Rapunzel are meanwhile found and chased by the guards. When they are trapped in a cave, Flynn admits that he is Eugene Fitzherbert, and Rapunzel reveals her magical hair. She saves them by using her hair as a light, leading them to safety and healing his Flynn’s hand. to take them out of the cave. Our main characters continues come closer to each other, but Gothel meets Rapunzel secretly in the wood, telling her that Flynn will leave her as soon as he has the crown. Rapunzel refuses to believe this, but chooses not to give him the tiara just yet. Maximus the horse becomes friends with Rapunzel, and a suspicious ally to Flynn, when Rapunzel charms him when he finally catches them. He takes them to the city, and Flynn takes Rapunzel to see the lanterns. He is captured by his old thieving friends, and Rapunzel returns home with Gothel, believing Flynn deserted her. Back at the tower, Rapunzel realises she is the missing princess she heard of in the city. She unsuccessfully tries to flee the tower. Flynn is saved from his death sentence by the thugs from the inn and Maximus. He rushes to the tower, and is stabbed by Gothel. Rapunzel tells Gothel that she will go with her forever if she is allowed to heal Flynn. Knowing that Rapunzel never goes back on her word, Gothel agrees. Knowing if he is healed, she will be captive forever, Flynn cuts off her hair, breaking the spell. Gothel ages rapidly, dying quickly. Flynn tells Rapunzel he loves her just as she dies, but her tears saves his life. They return to the kingdom, Rapunzel reunited with her parents, and they eventually marry. This is a happy ever after story, and I loved it. It represents everything modern Disney aims for – strong, independent girls, who has opinions and saves themselves. The Prince charming is more a side benefit than the actual present. Little girls should watch this to see they don’t need to act helpless to catch a man, and grown women should watch it just for fun. And hey, who doesn’t love a good love story? Friday was my birthday. It was really nice, and I decided to spend the night at home with family, and have a celebration with close friends the following night. Usually I just have a braai, but this time I just wanted something else. 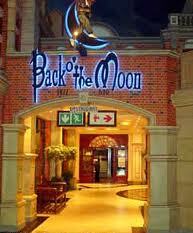 I decided to make a reservation at Back of the Moon in Gold Reef City Casino. I couldn’t have been more impressed. It was everything I hoped it would be, and more. The atmosphere was incredible, the waiter delivered incredible service, and the live jazz band added an amazing background. I had a rump steak, and it was divine. I would honestly recommend this to anyone in need of celebration. It is a bit pricey, but with the service and experience, it really is worth it. On Sunday, I witnessed one of the greatest soccer matches ever. Our South-African side, Bafana Bafana, played against the Moroccan side in an AFCON group match, at the Moses Mabhida stadium in Durban. It was the last match, and crucial to our team. A win or draw would put us through, and a loss would put us at the mercy of Cape Verde playing against Angola. Cape Verde won their match (well done to them) and so a draw or victory was essential for us. I only tuned in at half time, and the score was worrying, with a 1-0 lead to Morocco. I don’t know what Coach Gordon Igesund said to Bafana, but they came back attacking like crazy. Bafana’s relentless attacking on goal led to a truly superb goal in the 70th minute, by May Mahlangu. 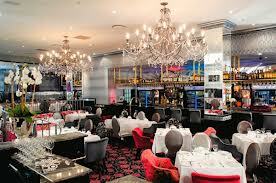 The restaurant we were in exploded! And further heartbreak when Morocco scored again. Siyabonga Sangweni had the entire South-Africa on its feet in the 86th minute, by equalising again. The game ended 2-2, sending South-Africa through to the quarter finals at the top of their group A log. Best part of birthday is cake – or in my case, my mother’s home-made lemon tart (it is so fricken delicious). And it doesn’t make you fat! Everyone knows you can’t gain weight on your birthday. Duh. 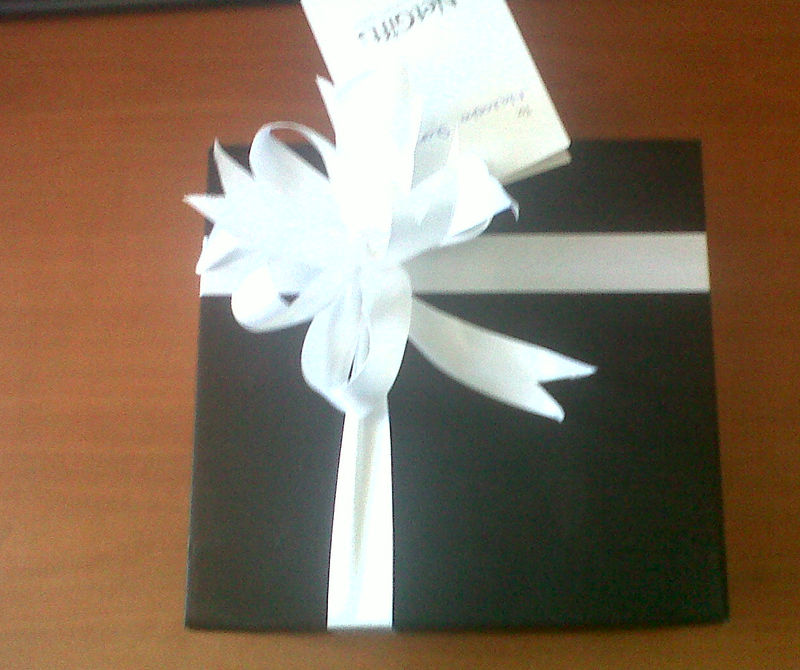 Take a look at my lovely gift from my sister. I am in love with the packaging! My Unisa is finally sorted, I am registered and can start on assignments. Excited, and I realise I sound a little obsessed. I am. Deal with it teehee. I am pained by grammar on some work I am reviewing. A bit scarred actually. I hope your day has been good as well. Mine will end of with a run, and then some studying. Oh, yes I have a wild life. Paper diaries are too expensive for the young adult, because clearly Facebook is the new place to put every sordid detail of your life on. You have ten million photos posted of yourself , with nearly half of said photos posed with duck face. You have the most virtual friends ever. You say LOL in all your comments or statuses. You are only happy in your relationship if there are ten million statuses about your awesome boyfriend. Correct spelling and grammar is dead. Go on people; ruin every language under the sun with your cool updates. You can insult anyone, without ever having to take them on face-to-face. 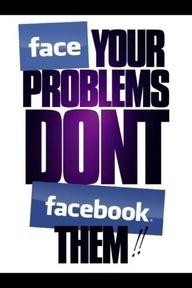 Because leaving vague messages on a social networking site is really grown up. Don’t delete/block an ex-boyfriend of enemy. They need to see how awesome your life is without them, and more importantly, you need to be able to still stalk their pages on and off. Connecting with people you haven’t seen in ages. It is an easy way to pass invitations to people. Let people know (important) stuff. Realising how many people you have met in your life. Being able to Facebook stalk. I totally get why so many people are just deleting their accounts. Facebook is amazing, but there are too many people you can’t delete without offending them, but they are so damn annoying that you know you will post something very sarcastic one of these days on their statuses and then they REALLY will be offended. What is your opinion about this? Is social networking slowly destroying itself or are you still obsessed with everyone’s lives? I leave you with a picture I would love to show everyone.. on Facebook. South-Africans have gone crazy. It is strike season. This refers to this part of the year when every employee in every sector suddenly feels that they are being misused, underpaid, and disadvantaged. I work in the nurses’ residence at a certain hospital, and we cannot get in every morning because the student nurses stand around at the entrance. THEY JUST STAND THERE. They refuse to go to class because they claim some teacher is failing them on purpose. While that is a credible concern, standing in front of a building and refusing to go to class will not fix anything. I probably need to be thankful that they are not resorting to the other methods of unhappy strikers. Here in SA, it is not uncommon for protesters to burn down buildings, barricade highways, burn tires, assault employees who are not striking, attack the police, etc., etc. Do not get me wrong. Their concerns are valid. Employment standards need to be seriously reviewed in this country, and working conditions are often unconstitutional. Anyone who suffers to exist on a measly salary will eventually get angered if they see their employers driving around in new Merc’s, BMW’s and Nissan Bakkies. My irritation stems from the facts that the country comes to a standstill every time someone is unhappy! So, this is my formal request to all South-Africans – please go through proper forms of communication to report your demands. Don’t ever buy decaf coffee if you haven’t tasted the brand yet. Bad things. I never in my entire life thought that one day I would be working with pee and blood. I am nearly twenty-three, and I have nothing valuable to show for it. My addiction to series is a serious problem. 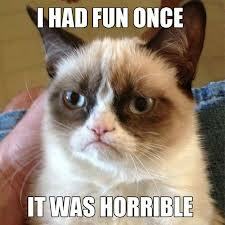 I love grumpy cat – he fits my personality perfectly. I am so relieved. After numerous failed attempts of registering at Unisa online, I decided to go in to their Florida campus and sort things out. My expectations were at its lowest. I imagined suffering through intolerable queues, rude assistants and impossible requirements (not so unexpected in South-Africa). What an experience! Our drive to the campus took longer than the actual time we spent in the campus. All the assistants and security guards were so helpful in friendly, and they helped me in ten minutes flat. I will now always go in and register instead of going online and suffering through slow internet and high volumes of users. Well played, Unisa. Well played.